In a few weeks, Leonardo DiCaprio will very likely win an Oscar for his performance in The Revenant. This result is just shy of a foregone conclusion not because DiCaprio’s turn as frontier trapper Hugh Glass is so undeniably great, but because (a) there is no truly “undeniable” Best Actor candidate this year, in terms of sheer merit, and (b) many people feel, not without some justification, that DiCaprio is due, having been repeatedly overlooked for excellent work in the past. (He’s only 41, but has been in the business so long—his first nomination was for 1993’s What’s Eating Gilbert Grape?—that the “always a bridesmaid” factor has kicked in early.) “It’s his time” doesn’t make for the most compelling Oscar narrative, though, so DiCaprio’s campaign has focused to a large degree on how grueling The Revenant‘s shoot was for him. We hear that he chowed down on raw bison liver, that his eyelids literally froze shut in the subzero weather, that he spent almost the entire production on the cusp of fatal hypothermia. “Oh, the sheer hell he endured on your behalf! An Academy Award is the least you could do to repay him,” nobody ever quite says out loud. Even if you didn’t already know, before viewing the clip, that Throne Of Blood is a Japanese take on Shakespeare’s Macbeth, the sight of a grove of trees advancing on a castle would likely tip you off. Kurosawa takes even more liberties with the play than did Justin Kurzel in his recent adaptation, tossing the poetry (at least to judge from the English subtitles, which are quite prosaic) and ditching aspects of the plot that don’t serve his needs. Throne Of Blood’s equivalent of Macduff, for example, called Noriyasu, plays a much smaller role in the movie than he does onstage; the character is neither seen nor mentioned for most of the second half, and Washizu (a.k.a. Macbeth) never bothers to have his family killed. As a result, the second prophecy—told by one creepy forest spirit rather than by three witches—assures Macbeth only that he’s invincible until the trees of the nearby forest advance upon him, without mentioning that “no man of woman born” (a reference to Macduff, delivered via Caesarean section) can kill him. Kurosawa thus had to invent a new way for Macbeth to die—and maybe for Mifune to die, too. Because those are all real arrows. Now, Mifune did wear protective boards underneath his costume, to ensure that the arrows actually shot into his torso wouldn’t penetrate his flesh. And those arrows were tricked out with long, sharp needles affixed to the arrowheads, designed to do less damage in the event of an error. But the spectacle doesn’t work unless the majority of the arrows get embedded into the walls right beside Washizu. So Kurosawa hired skilled archers and had them shoot arrows en masse to Mifune’s immediate left and right. That Mifune agreed to do this boggles the mind, as what befalls Washizu at the end of the scene could have befallen Mifune himself, should one of the archers have slipped or misjudged the angle or whatever. Imagine how long it must take a knife-thrower’s assistant to feel little or no apprehension when tied to a board and watching blades THWACK inches from their head and body. 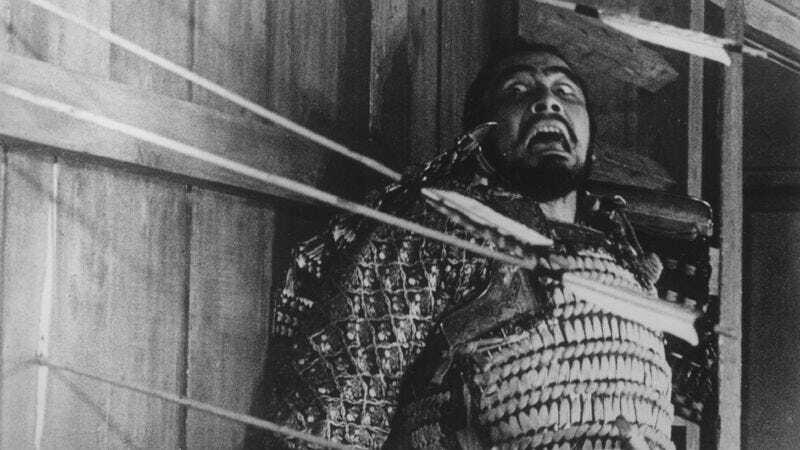 Mifune likely had little or no time to get comfortable; however confident he was in the group’s collective accuracy, the actual experience of all those arrows zipping so close to him must have been terrifying. And that terror shows onscreen. Mifune wasn’t always the most subtle of actors (though he was perfectly capable of reining it in when a role required subtlety rather than bravado), but Washizu’s hysteria here goes above and beyond the call of dramatic duty; everyone involved with Throne Of Blood, including Mifune himself, always maintained that his reactions are largely unfeigned, simply because there was little need to feign them. While it’s possible that this is just hype, not unlike all the Revenant hype, he deserves the benefit of the doubt, especially after looking at the scene closely. Early on, when Washizu is moving from left to right, you can see Mifune falter slightly in his step as he approaches the target area—he clearly knows where the arrows are going, and he’s momentarily afraid he’s going to arrive at that spot before the archers let fly, so he pauses very briefly to wait for the volley. (It’s just a split second, but it’s visible.) And it’s not as if Mifune did it once and then heaved a big sigh of relief. Kurosawa shoots the sequence from multiple angles; even if each was a single take (unlikely), that’s a whole lot of flinching. Of course, the final arrow shot at Washizu is movie magic. For 1957, the illusion of it penetrating Mifune’s neck is remarkably convincing, and the trick turns out to be quite simple: An archer shot an arrow in front of Mifune, approximating the right trajectory, and the movie cuts, midway through the arrow’s flight, to a shot of Mifune already impaled by a fake arrow. Throw in the right sound effect and the human brain readily connects the dots—even after knowing how it’s done. (Going through it frame-by-frame reveals the edit.) Today, the entire sequence would likely be created digitally, without any physical projectiles whatsoever… and would probably have a small fraction of the impact, if only because the actor would actually be acting. On one hand, maybe Kurosawa’s insistence on realism was irresponsible, but on the other, it’s a distinct cinematic advantage that he threw caution to the wind, and somehow persuaded Mifune to do likewise. There’s a primal element to this scene that probably couldn’t have been achieved in any other way. Plenty of arrows whiz through The Revenant, too, but for all of DiCaprio’s travails, there’s never a comparably galvanizing moment. He got off light.